Potty Training in a Weekend - Success! - Baby Doodah! This was our song after the first time peeing on the potty!! For the remainder of the day, I kept putting him on the potty every 20 minutes (I set a timer on my phone, so I didn’t forget). He peed several more times throughout the afternoon, but he had definitely gotten it. He wasn’t telling me he needed to pee, but he knew when I put him on the potty what he needed to do. We ended the first day with only ONE accident! And, that was really my fault, I had left the room to put the dishes away from the dishwasher, thinking he’d be okay for 10 minutes since had just gone, but I was wrong. No big deal, though! We cleaned it up and kept on truckin’! Saturday went even better than the first. I left him without anything on his bottom for half of the day, until after nap time (I’ll talk about nap time and bedtime, in a bit). I wanted him to get a little more practice, with me watching him like a hawk, before we put him in undies. Undies can occasionally be confusing to a toddler because they think they’re wearing a diaper. However, once Emmett was in undies, he did great! We put him on the potty every 20 minutes, even if he resisted, told him to go pee, and then waited a few minutes, before taking him off. Another thing I want to mention, is that we did not have a poop at all on Friday, so I knew at some point on Saturday, he’d need to go. So, in order to entice him to sit on the potty longer, I allowed him to have his binkie, blankie, and tablet while sitting on it. It worked like a charm! Around mid-morning, he was sitting on his potty when he went poop! He was so proud of himself, we were proud for him and we all did a little poopie dance. He also got a very cool surprise, a toy Hot Wheels tow truck. After nap, we put him in his undies and didn’t have a single accident! We kept taking him to the potty frequently. I think we spaced it out to every 30 minutes, and then as the day wore on, we did every hour. We were even able to go out to dinner, and to Trader Joe’s without an accident Saturday night. We just took him to the potty when we got to wherever we were going, and then again before we left. He definitely wasn’t peeing each time, but he would some of the times, and that kept him from going in his undies! We couldn’t have been more excited, and proud of our little man! If I’m remembering correctly, I think we had one accident first thing in the morning, but other than that it was an accident free day! He wore undies and pants all day, and used the potty just like a big boy. Success! 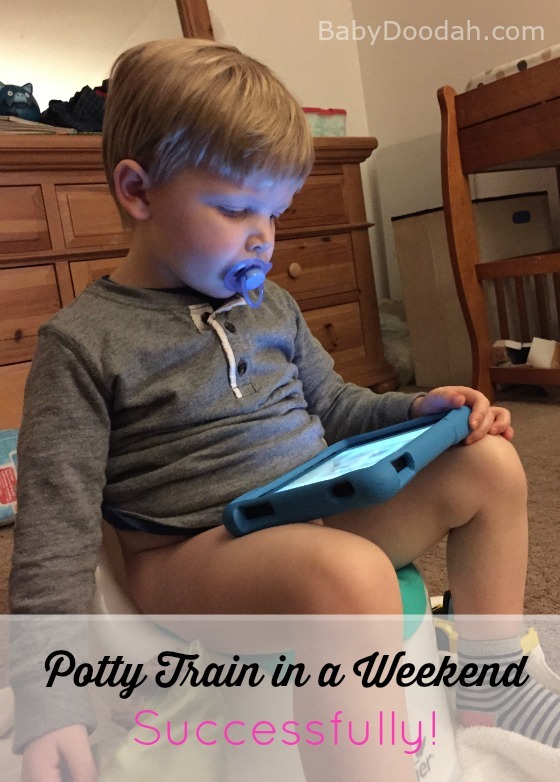 I wasn’t skeptical of whether Potty Train in a Weekend would work or not, I knew it would at some point. I was just unsure of whether Emmett was ready, but he clearly was. Emmett goes to day care 2 days a week, and I was concerned that he’d have lots of accidents there. One, because he’d be distracted playing with all of the toys and two, because there are other kids and I worried they wouldn’t get to Emmett in time. You’ve probably guessed by now that Emmett is not sleep trained, yet. The book recommends that you hold off on sleep training, until they have day potty training down, and until they’re in a toddler bed. Emmett is still in a crib, and probably will be for a few more months. We will eventually, get him into a toddler bed, but I want that to happen after our move. So, at nap time and at bed time, he wears a diaper. He often wakes up from nap time dry, and we run him right to the potty. Bed time he’s still waking up quite wet, which means his bladder isn’t ready to hold all that pee overnight. We’re fine with this, we’ll get there. As you can see, this method works! It isn’t easy, and takes time and dedication on the parent’s part, but IT WORKS! I’m SO glad we went this direction, and despite how rough Friday was at times, I wouldn’t have changed it for the world. I got to spend a lot of time with Emmett just cuddling, playing and listening to him talk. I think I sometimes take for granted how quickly he’s growing up! If you’re interested in purchasing the book for yourself, you can do so by clicking here: Potty Train in a Weekend. 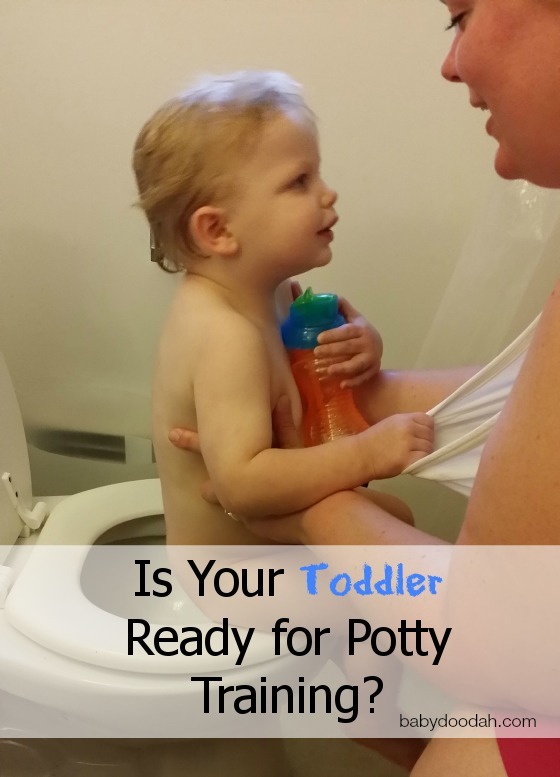 Have you tried potty training your child and struggled, or possibly went back to diapers? What finally worked? Or, if you’re still not potty trained, how can I help? Your results may vary. Please consult a physician with any medical questions or concerns. This post may contain affiliate links. This does not change the price for you, I simply receive a portion of the sale. Thank you for helping to support my family! 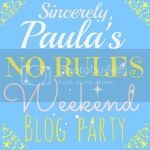 17 Responses to Potty Training in a Weekend – Success! 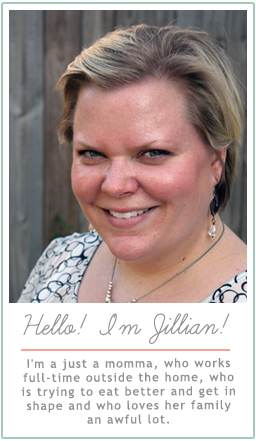 I love this post Jillian,I didn’t know anything about this method.Potty training is a hot topic at the moment. I’m going to try this method ,I really hope we succeed!! 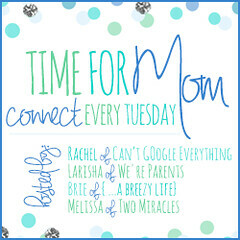 My favorite post for next week’s Turn It Up Tuesday! I have one who will eat anything and evrtnehiyg, one who pretty much eats anything with just a few exceptions, and then one who would like to live on pizza and pb&js.